Canadian Comedy Veteran David Tsonos returns with his sequel to his solo show 2015 Walking the Cat, this time he has a new Cat Mitzy and she takes centre stage as he deals with problems of adoption, veterinarians, catnappings and a murder. 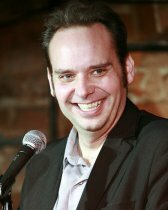 David will use his storytelling and stand-up abilities to regale the audience with all his funny adventures of cat ownership. If you're a cat person or a dog person he will make you laugh until you can laugh no more, (well maybe a little more).